T he debut album Society of Broken Souls (SBS), Things Still Left Unsaid,glows with mature lyrical songwriting, nuanced vocals, and wonderfully subtle instrumentals. 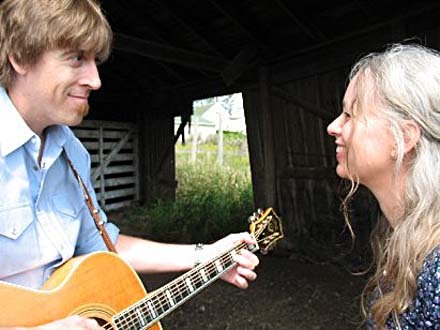 Originally from Seattle, the now Fairfield-based husband-and-wife duo Dennis James and Lauryn Shapter have written and performed under the name Truckstop Souvenir for more than ten years while touring throughout 25 states. Now they’ve reinvented themselves as Society of Broken Souls. Things Still Left Unsaid is their crowning achievement. On their website, they describe the music as “confronting our shared, raw humanity while celebrating the beautiful mosaic of the human experience.” The slow-to-mid-tempo songs offer vignettes about dreams, tender hearts, and travels on the open road. The closest comparison to SBS is Cowboy Junkies, with Margo Timmins laying down sultry vocals backed by a wonderful band. Both Dennis and Lauryn are multi-instrumentalists who show their vast talent by changing roles on drums, bass, keyboards, organ, violin, viola, and electric and acoustic guitars, while recording the entire CD in their tiny attic studio. Troy Morgan joins them on bass for three tracks. I especially enjoy how Dennis’s adept electric guitar frames Lauryn’s exquisite lyrics and vocals. The opening track, “Tired of Toein’ That Line,” sets the tone for the entire album. Lauryn lays down double-stopped violin Americana style. A harmonica moves in. When Lauryn takes the lead on vocals, Dennis joins in with backing harmonies and electric guitar. This song already sounds like one you might find in the Americana songbook. • “Shape I’m In” (written and sung by Lauryn) begins with acoustic and reverbed electric guitars that lead into the plea, “Please don’t leave me / Here to drown in the dark / Of this boundless blue sky / Where I can’t find my heart.” It’s the first of several verses juxtaposing the wonder of nature’s beauty with the sorrow of “things still left unsaid.” The chorus laments how the sun “bleaches the bones of the skeletons who roam with me.” Lyrics and guitar blend delightfully. Although the tone and lyrics seem sad, the effect is sweet and lifting. Isn’t that what we call melancholy? • “Rough Road, No Shoulder” (written and sung by Lauryn) is a mid-tempo upbeat reflection about a road trip with a “kaleidoscope of colors in a watermelon sky . . . a slender moon . . . static crackling on the AM radio . . . high beams on the midnight road” and finally, “a sign up ahead / By the side of the road / Out here in the fading light / Rough road, no shoulder.” This one really conjures Cowboys Junkies in their best form, straddling country music and ballad songmaking. • “On the Other Side” (written and sung by Lauryn) warns of liquor’s curse, only redeemed by life “on the other side” that may offer “the peace I’ve been denied.” The ghostly Chris Isaak-style guitar lilts and turns deliciously across the verses. The song fades with church bells in the distance as if beckoning from the other side. I’m eager to hear more of this new musical direction from Dennis and Lauryn. Join in the celebration of the CD release on May 21, 2016, at 8 p.m. at Café Paradiso in Fairfield.